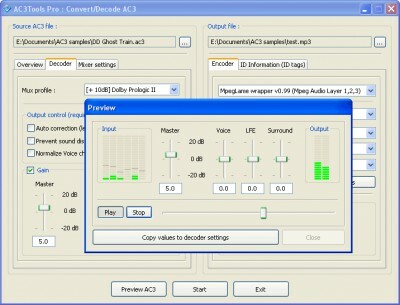 AC3Tools Pro 1.21.096 is audio encoders/decoders software developed by MediaTwins s.r.o..
AC3Tools Pro is the complete professional suite for AC3 files processing that enables to decode AC3 files into two-channel MP3, WMA, WAV or Ogg Vorbis files, extract each channel from an original AC3 file into separate files and recompose WAV PCM files into AC3 being sophisticated encoder that offers superior audio performance. AC3Tools Pro supports Dolby Prologic and Dolby Prologic II profiles to maintain full-bandwidth surround sound. This audio & multimedia software is shareware, which means you can download and use AC3Tools Pro 1.21.096 for free during the trial period (usually for 30 days). At the expiration of the period you will have to buy the audio encoders/decoders product for $49.95. AC3Tools Pro 1.21.096 is available at regnow and MediaTwins s.r.o. website. AC3Tools Pro 1.21.096 supports English interface languages and works with Windows 98/XP/Vista. Latest AC3Tools Pro 1.21.096 does not contain any spyware and/or advertise modules, allowing installing it with no worries concerning valuable information loss. 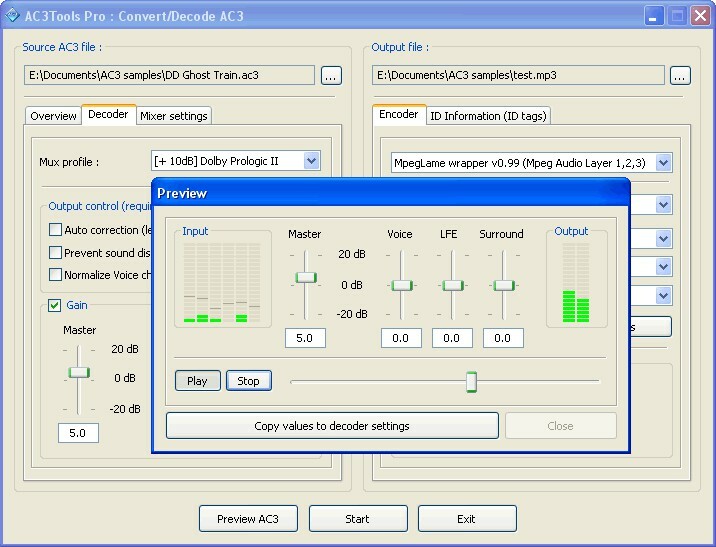 We has completely tested audio encoders/decoders software AC3Tools Pro 1.21.096 many times, written and published the interesting article and uploaded installation file (5791K) to our fast server. Downloading AC3Tools Pro 1.21.096 will take minute if you use fast ADSL connection. The Nuendo Dolby Digital Encoder software plug-in allows Nuendo Projects to be encoded into Dolby Digital. The Nuendo DTS Encoder incorporates the DTS Coherent Acoustics audio compression algorithm. MP3 Surround is for personal and non-commercial use and intended to demonstrate the MP3 Surround technology available at Fraunhofer IIS.